Caroline showed her “Something Old…Something New” collection at Oriel Wrecsam | Wrexham Art Gallery from January to March 2014 for their Applied Arts showcase. For more information and to find out about future exhibitions follow Oriel Wrecsam on facebook. Its non-stop at the moment! September is fast approaching, and so too is Helfa Gelf / Art Trail. An open studio event that takes place across North Wales and includes artists of many disciplines. I will be opening my studio and welcoming visitors to come and see where I make hand crafted contemporary jewellery. Pamela Peters a jeweller from Deganwy will be joining me in the workshop and we will be happy to explain the techniques and inspiration behind our work. 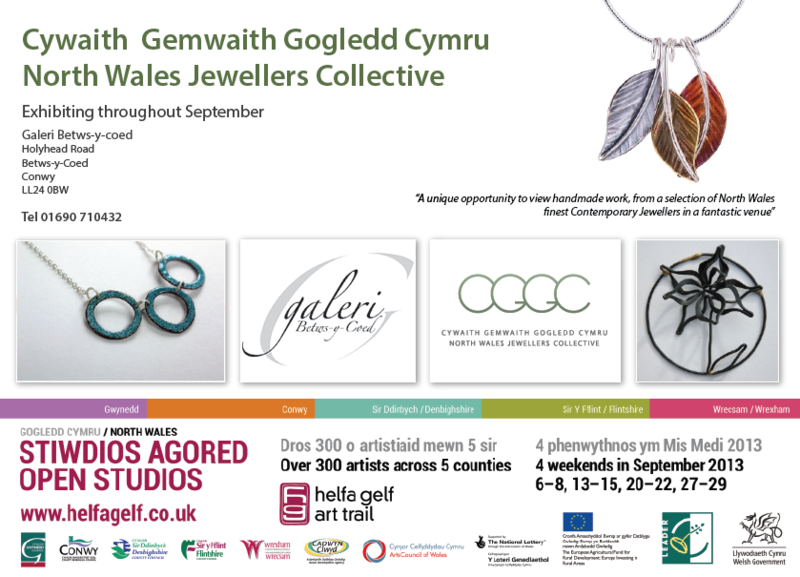 It doesn’t stop there, CGGC - Cywaith Gemwaith Gogled Cymru / North Wales Jewellers Collective have another group show, exhibiting throughout September at Galeri Betws y Coed. 12 members will be exhibiting in the beautiful upstairs gallery space. The stunning scenery and gorgeous gallery make this well worth a visit. My work will be on display with a eclectic mix from North Wales based makers; Ann Catrin Evans, Angela Evans, Sarah Anderson, Hannah David, Sarah Wilkie, Sara Lois, Lora Wyn, Hannah Coates, Pamela Peters and Karen Williams. I am busy getting stock made for the Eisteddfod next month! Very excited as I have never been to the eisteddfod before and will be exhibiting my work along with 8 other members from CGGC - Cywaith Gemwaith Gogledd Cymru | North Wales Jewellers Collective, including Ann Catrin Evans, Annie Williams, Sara Lois, Angela Evans, Jane Fairbairn, Kriket Broadhurst and Pamela Peters. We received funding from The Arts Council Wales to launch the group officially, and what better place for us than the National Eisteddfod of Wales! Come along and say hello.